It’s free live wallpaper that will help you to rest and relax by watching them every day. Summer weather with beautiful sun and clouds. Sun rotating and gives you happiness. Clouds are moving across the screen and give a feeling of freshness with clear blue sky. 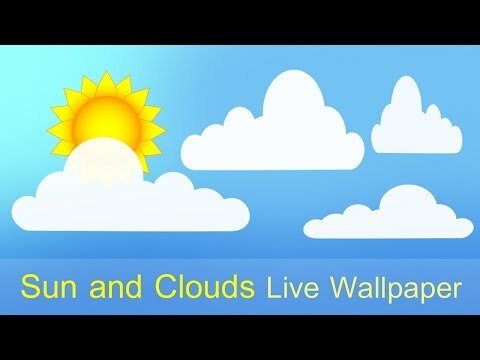 You can customize quantity of clouds for your device screen.So, these live wallpapers is a wonderful solution for your phone or tablet. Sun and Clouds live wallpaper is lightweight and easy to use, and free, ofcourse.Decorate your device in summer season, try “Sun and Clouds”!FEATURES- Great graphics, good functionality and easy to use.- Adjust quanity of clouds.- Swipe left or right to set sun rotation direction.- Optimized for most android devices: smartphones, tablets, etc.- Multilingualism and support the developer.CONTENT POLICYAn application “Sun and Clouds” is free to use and distribute for all users, but it ad-supported. Version 1.1.1- Now app starting and work more quickly.- Updated Android SDK. – Now no more supports Android 2.3.3 (Api 10). Requirements is Android 4.0 (Api 14) or higher.- Updated LibGDX version to 1.9.8.- Optimized code, fixed bugs.- Updated Ads SDK. Version 1.1.1- Now app starting and work more quickly.- Updated Android SDK. - Now no more supports Android 2.3.3 (Api 10). Requirements is Android 4.0 (Api 14) or higher.- Updated LibGDX version to 1.9.8.- Optimized code, fixed bugs.- Updated Ads SDK.